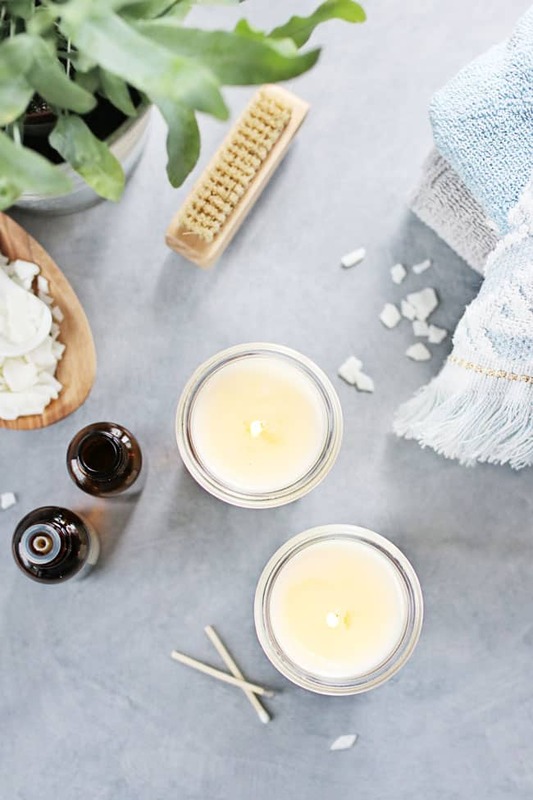 For the price of a massage at the spa you could invest in quite a few high-quality essential oils to make tranquil, soothing, yummy smelling massage candles to [literally] have at your fingertips any time you want. 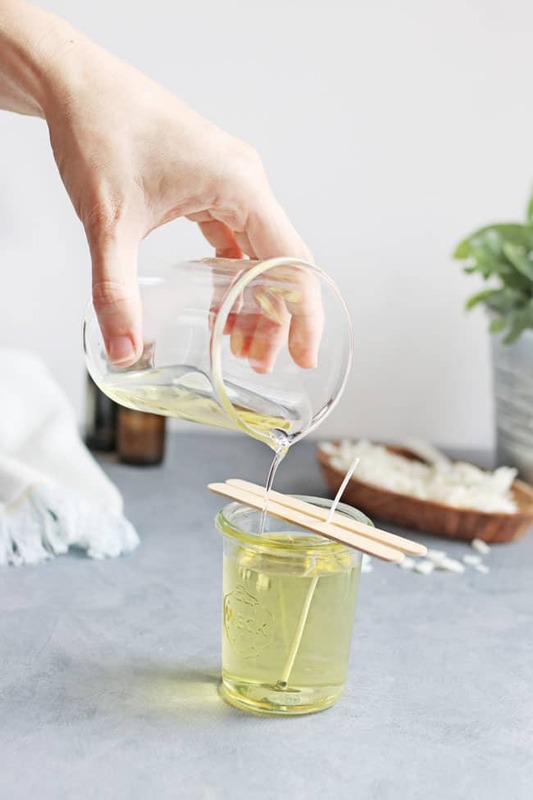 A combination of soy wax and other skin-soothing oils, massage candles melt easily and are cool enough to pour right on your skin for a soothing, spa-like treatment. The supplies are relatively easy to round up, if you already have your oils just make a quick stop at the craft store, or order your wicks online. I searched high and low at one of my favorite thrift stores in search of a gravy boat because, c’mon, how perfect would that be? Heat safe: check, Easy pour spout: check! A potentially perfect vessel for a massage candle, but alas, I wasn’t able to find one. 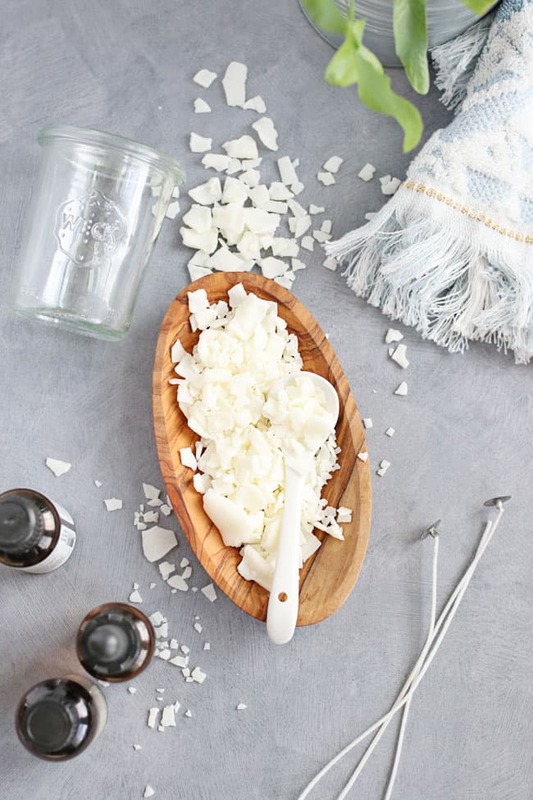 Measure out 3 ounces of soy wax flakes and melt in a microwave safe glass. My wax took about 90 seconds to melt completely, but each microwave is different so your time may vary. While the wax is melting, place the wick in your candle jar. Be sure the wick is straight, and that the tab is pressed to the bottom. 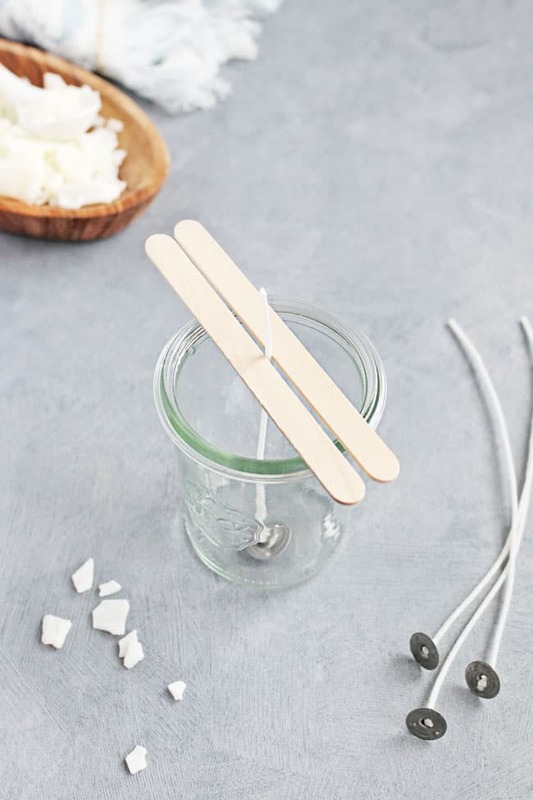 Help keep it in place by placing popsicle sticks on each side of the wick. 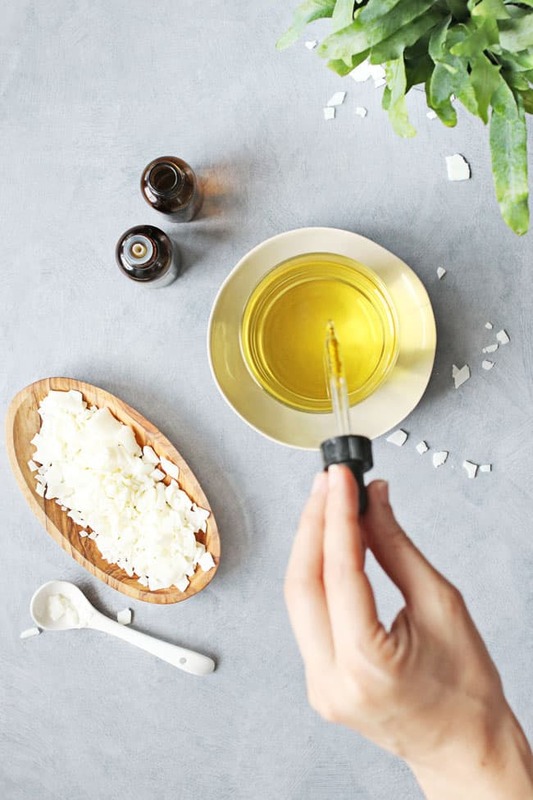 Add 1 ounce of jojoba oil to the melted wax and stir together. Add 1/2 teaspoon of vitamin E and stir again. Now the fun part: Create your amazing smelling candle by adding in your favorite combinations of essential oils. I love using spicy oils like clove and bergamot as a base and add in a few drops of a citrus like clementine just to keep things interesting. About 30 drops divided between your favorite scents will give you a really pleasant candle that isn’t too strong. Use oils such as ylang ylang, chamomile, lavender, sage, cedarwood. Use oils such as anise, rose otto, nutmeg, sweet almond, lavender, marjoram, and chamomile. Stir to blend all ingredients. Carefully pour your mixture into the jar and let it set up for an hour or so. 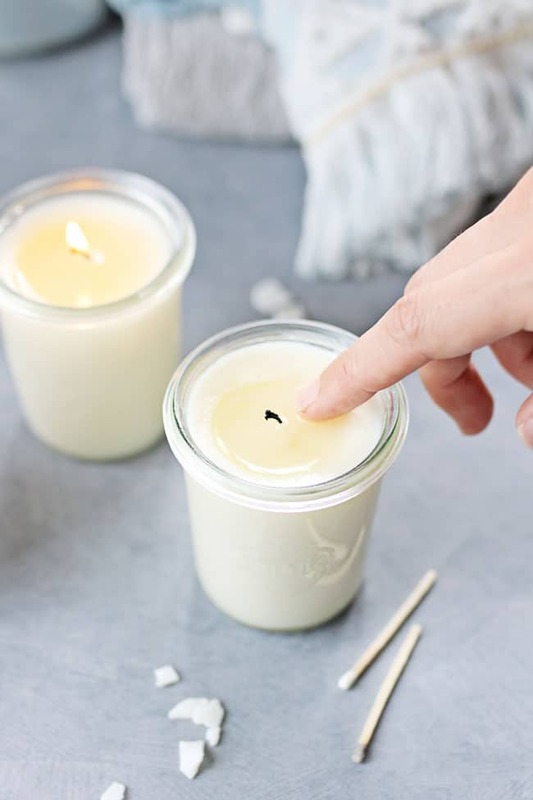 Once the candle wax becomes solid, trim the wick. 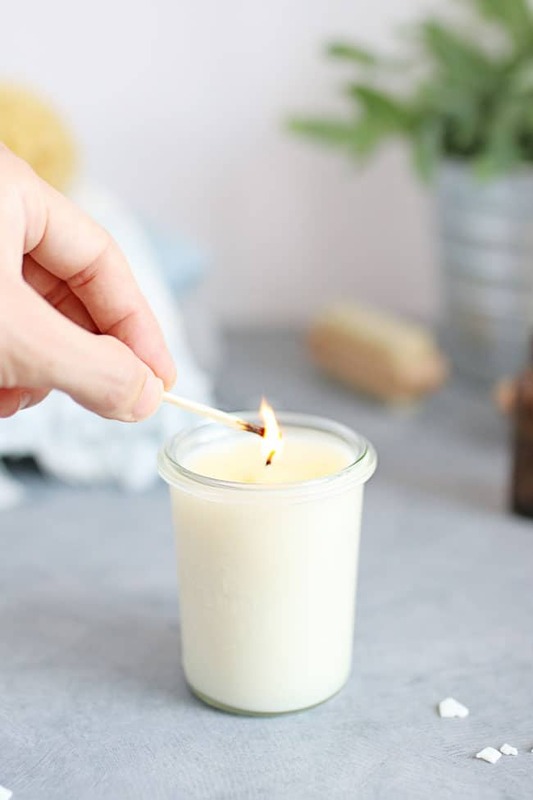 Light the candle and let burn for 15-20 minutes to allow a small pool of wax to form around the wick. Carefully pour the wax into your hand, or dip the tips of your fingers in the wax and massage the oil into the skin. Will this work with coconut oil? And how well will it work using Cologne? Could I use coconut oil? I love decorative candles: Thanks for the sharing ! Another way to keep the wick from moving is to use a small glue dot on the tab. 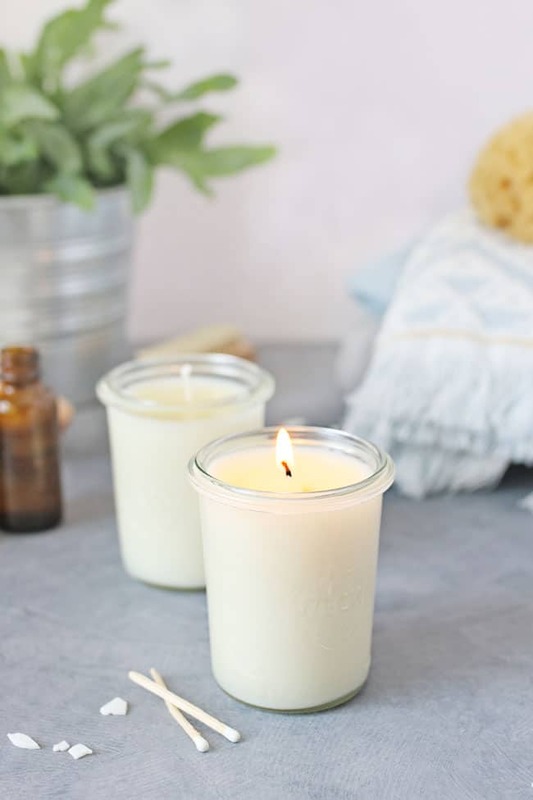 And while you can certainly use beeswax in candles, in a massage candle it will be too firm as a 1:1 replacement for soy wax. Could you also use beeswax?